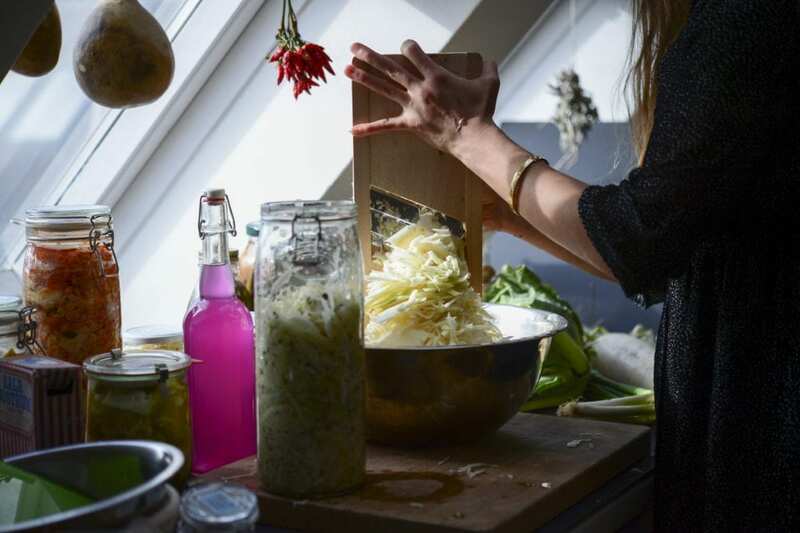 Sauerkraut is both a classic case of fermentation and a favorite food choice in Germany, where average per capita consumption reaches 2.6 pounds per person per year. Sauerkraut, or literally “sour cabbage,” came to Germany in the 16th century from China and became a popular food after being identified as a “safe” way to preserve food, when it was linked to the absence of scurvy in seamen. The mechanism of fermentation operates through two main steps: (1) by oxidizing(losing electrons) the substrate to an organic intermediate and (2) by reducing(gaining electrons) to create the end products. The reduction-oxidation balance is maintained throughout the pathway by coupling oxidations(electron LOSS) with reductions(electron GAIN), ATP hydrolysis (reaction where ATP bonds are split, releasing large amounts of energy) powers the reaction. These couplings allow the reaction to proceed when otherwise it would be unfavorable. So how is that happening in CABBAGE to make SAUERKRAUT? Sauerkraut fermentation falls into a specific category of fermentation called lactic acid fermentation, which focuses on the ability of lactic acid bacteria to produce (sourness) acid. As a side note, this does not mean milk there is milk acting on the pickles, this is just a type of bacteria that also operates in milk fermentation, and is termed “lactic acid”. Lactic acid bacteria fall into two main groups – homofermenters and heterofermenters – which basically means that there are two different pathways through which sugar is converted to lactic acid. Now let’s take a look at what’s happening at each step of the process. Here is a recipe and scientific explanation for SUPER SIMPLE / CLASSIC KRAUT! Chop/shred cabbage. By breaking the cabbage into smaller pieces this increases the surface area and liberates the sugars, thus allowing the microorganisms to break the glucose in the cabbage down faster. Place shredded cabbage in a bowl and add salt. Salt acts as an effective antimicrobial agent, drawing water from the plant cells. Apply pressure to the cabbage/vegetables until juices are released. These juices contain fermentable sugars and nutrients suitable for microbial activity. Press cabbage into a jar, pressing cabbage underneath liquid. Add water if necessary & cover the jar. This desired microorganisms operate best in oxygen-free conditions, allowing oxygen into the jar would allow the undesired bacteria to grow. The first microorganisms to start acting on the cabbage are the L. Mesenteroides cocci bacteria. These bacteria metabolize sugars through the hetero-fermentative pathway, yielding lactic acid, acetic acids, CO2 and ethanol (Hutkins, 2018). These products inhibit the growth of non-lactic competitors and favor the growth of subsequent species of lactobacillus. The bacteria draw out the oxygen, making the environment more anaerobic, thus more suitable for lactic acid bacteria. The L. Mesenteroides begin to slow down around acidity levels of 0.3%, eventually inhibiting themselves when concentration reaches 1% (Hutkins, 2018). Leave for 2 weeks – 1 month in temperature of 18-22℃. The bacteria take time to do their work, so leave them in peace at a temperature that favors production of desired bacteria. After the L. Mesenteroides bacteria, bacterial activity is continued by L. plantarum and L. brevis. These bacteria, unlike the cocci, are partially inhibited at high salt concentrations, which is why they act after the L. Mesenteroides bacteria. These bacteria are strong acid producers and during this stage they bring the acid content to 1.4-1.6% (Hutkins, 2018). The final stage is characterized when an acidity of 1.6% is reached; the acid tolerant L. plantarum as the primary bacteria in this stage. This final stage takes around 2-3 weeks to reach completion, when the acidity is approximately 1.7%, yielding the end products, lactic acid, acetic acid, ethanol, CO2 and esters (Hutkins, 2018). Enjoy your kraut. There’s a magical blend of lactic, acetic and propionic acids, carbon dioxide, alcohol and esters waiting to be eaten! Lactobacilli bacteria operating in the second stage are sensitive to high concentrations of salt. If there is too little salt at the beginning, the lactobacilli will grow rapidly. The lactobacilli have a greater ability than the cocci to break down cabbage tissues. Thus their rapid growth will result in soft, mushy, cabbage as the end product. Because the lactobacilli are sensitive to high concentrations of salt, their growth will be inhibited if there is too much salt. Conversely, undesirable bacteria are tolerant to high-concentrations (5-7%) of salt, making it important to add the suggested 2-3% salt (Battcock & Azam-Ali, 1998). Otherwise, the presence of unwanted bacteria could be favored – spoiling the product. Color discoloration can result from not covering the kraut with sufficient juice, creating aerobic conditions which enable undesirable aerobic bacteria/yeasts to grow on surface (Battcock & Azam-Ali, 1998). Temperatures of 18-22 C are ideal for L. mesenteroides, the bacteria which initiates fermentation. Higher (or lower) temperatures will favor the growth of other bacteria, disrupting the sequence of bacterial activity that produces sauerkraut (Battcock & Azam-Ali, 1998). Thankfully, it’s not hard to make a good kraut. 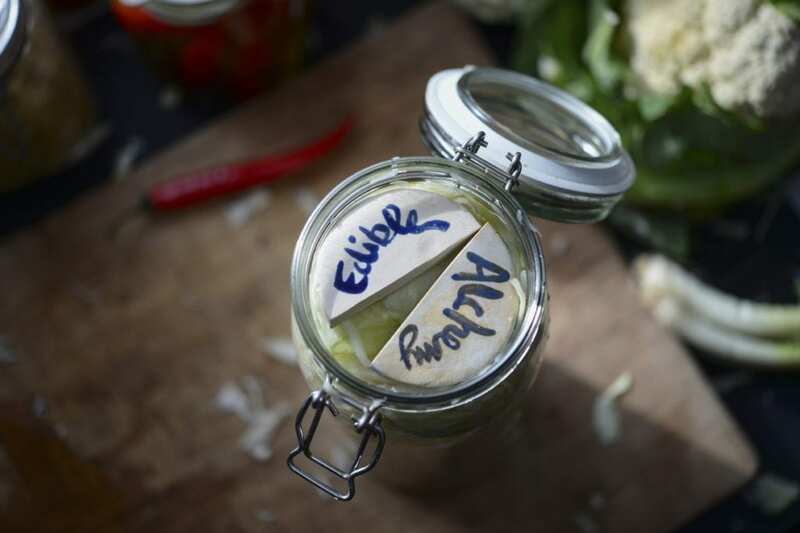 A successful fermentation relies on creating an environment which promotes the desired microorganisms and inhibits the undesired microorganisms – by adding 2-3% salt, excluding oxygen and leaving the jar in 18-22 ℃ environment. 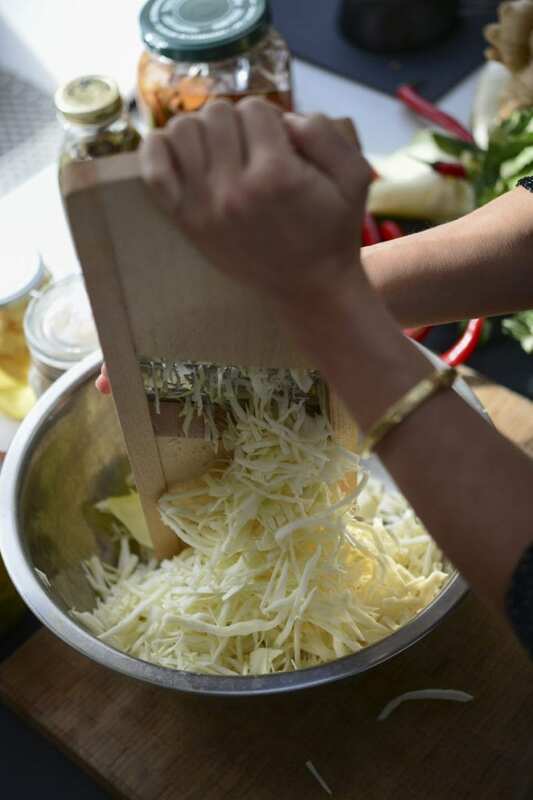 If these steps are taken, the desired bacteria are selected for and you’ll have a delicious sauerkraut in no time! 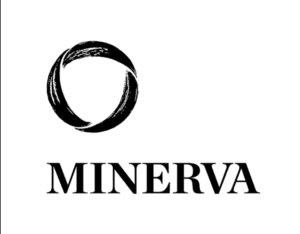 Edible Alchemy has connected with Minerva University science students to bring more science, understanding and ideas to the community. Let us know what you want to know about! 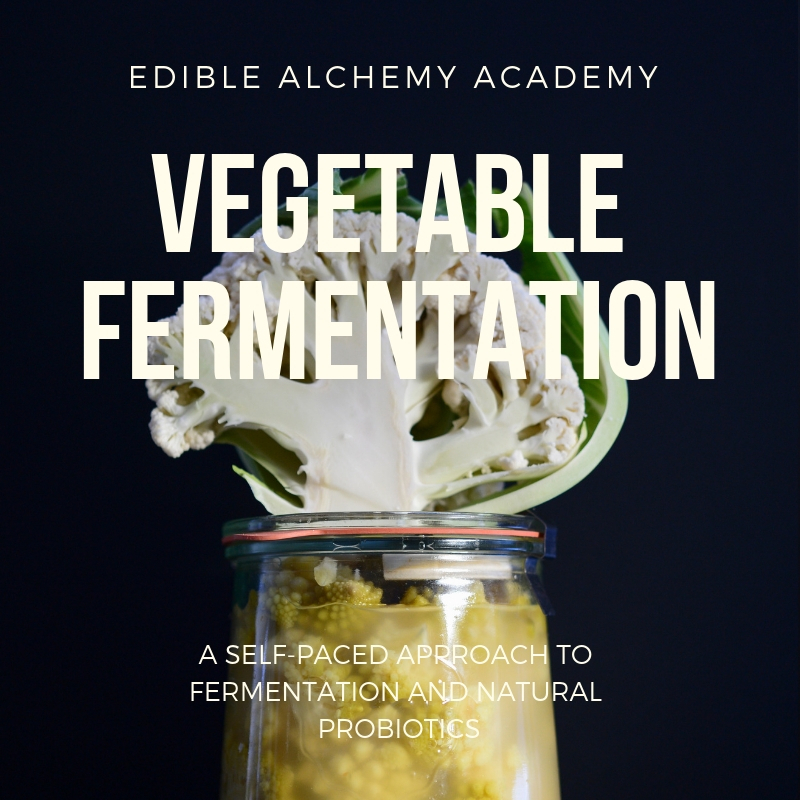 Let’s get deep into the subject of fermentation, the microbiome and probiotics. This article was written in partnership with Minerva student Hana McMahon-Cole. Hana is a junior at the Minerva Schools at KGI, studying cells and organisms, an interdisciplinary major combining biology, chemistry, and bioengineering. She is interested in science communication, long-distance running and learning new languages. GLOBAL PERSPECTIVE. Rome, Italy: Food and Agriculture Organization of the United Nations Rome, Chapter 5, Chapter 2. Biocyc.org. (2018). MetaCyc EC 4.1.2.9. [online] Available at: https://biocyc.org/META/NEW-IMAGE?type=REACTION&object=PHOSPHOKETOLASE-RXN [Accessed 6 Nov. 2018]. Boudreaux, K. (2018). Chapter 5 Carboxylic Acids and Esters. Angelo State University. German Foods (2018). Sauerkraut, Germany’s Superfood. [online] Germanfoods.org. Available at: https://germanfoods.org/german-food-facts/sauerkraut-superfood/ [Accessed 6 Nov. 2018]. Goertz, A. (2018). Edible Alchemy Home – EDIBLE ALCHEMY. [online] EDIBLE ALCHEMY. Available at: https://ediblealchemy.co/ [Accessed 7 Nov. 2018]. Hutkins, R. (2018). Microbiology and Technology of Fermented Foods. 2nd ed. John Wiley & Sons. Todar, K. (2018). Diversity of Microbial Metabolism. [online] Textbookofbacteriology.net. Available at: http://textbookofbacteriology.net/metabolism_3.html [Accessed 6 Nov. 2018].